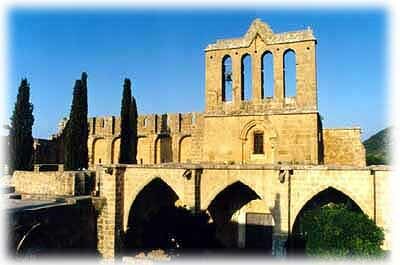 To the north-east of Kyrenia (Girne), set on the side of a mountain, this twelfth-century monastery is a fine example of Gothic architecture of the Lusignan period. The abbey comprises of a church, refectory, dormitory and storage rooms grouped around an inner courdyard. It was originally occupied by a French brotherhood, the Order of Premontre, and was known to them as the "Abbaye de la Paix". During the reign of the Latin kings, this order was held in great esteem. The abbot was allowed to wear the protifical mitre during mass, and was accorded the honour of carrying a sword and wearing golden spurs while riding. The beauty of Bellapais is legendary. Set in the mountains, just ten minutes above Kyrenia, a visit to this 14th century Lusignan abbey with its fabulous location and pervasive atmosphere of calm is a must. When Lawrence Durrell, famous British author, bought a house in the village of Bellapais, he felt 'guilty of an act of fearful temerity in trying to settle in so fantastic a place'.